You can now hide custom libraries from specific users. This allows you to create libraries that are only accessible by specific people within your organization. This works great for R&D drawings and documents or to simply separate the drawings for different departments. Administrators can hide libraries by visiting the users settings and deselecting the libraries that you wish to hide from each specific user. You can now share multiple items at once. Simply select a group of items and then click share. 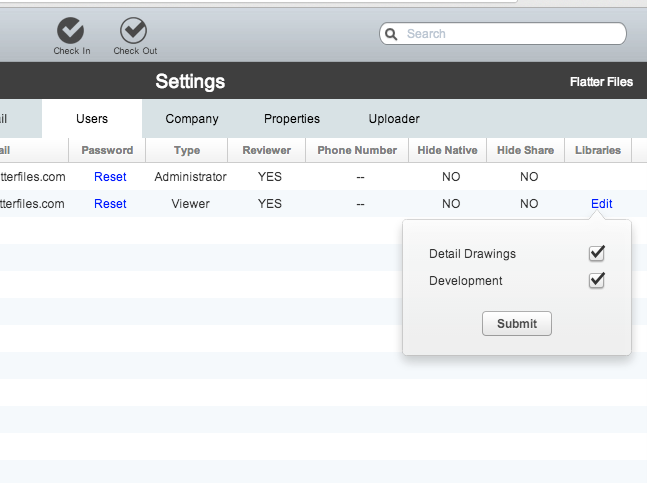 Once the share is created you can select another group of drawings and then right click and select "Add to Existing Share." This allows you to perform multiple searches and continue selecting and adding items to a shared item. The person you are sharing these items to will receive an email with a single link. Clicking this link will allow them to log in with the password you provided at which point they will see a list of drawings where they can select the item to display. This list is also searchable such that large groups of items can be shared and easily accessed. 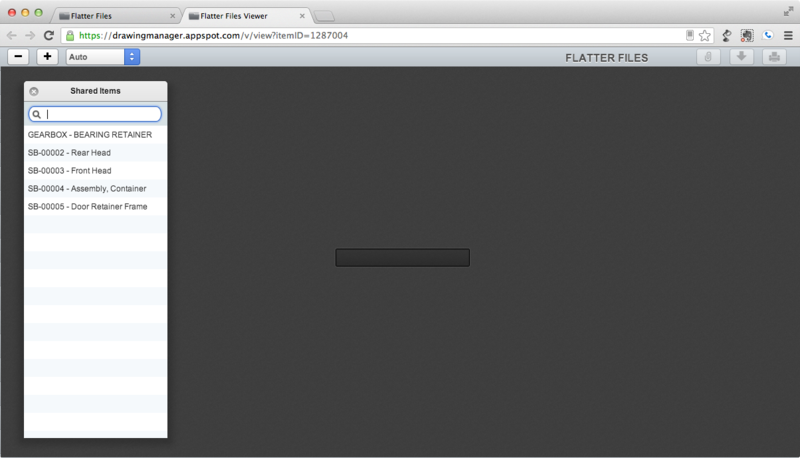 A new web application has been created that simply allows you to search for and view your content on Flatter Files. This works across all browsers and all devices. Thus, you can now access your content within mobile web browsers on Android and other mobile devices. Whenever you try to login to the main web app on any mobile browser or Internet Explorer 8 and earlier you will be redirected to this simplified search app. 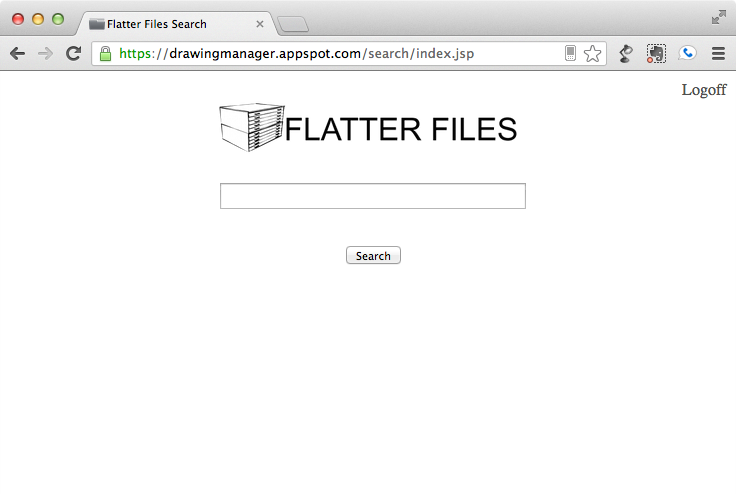 You can also access the search app directly at flatterfiles.com/search. 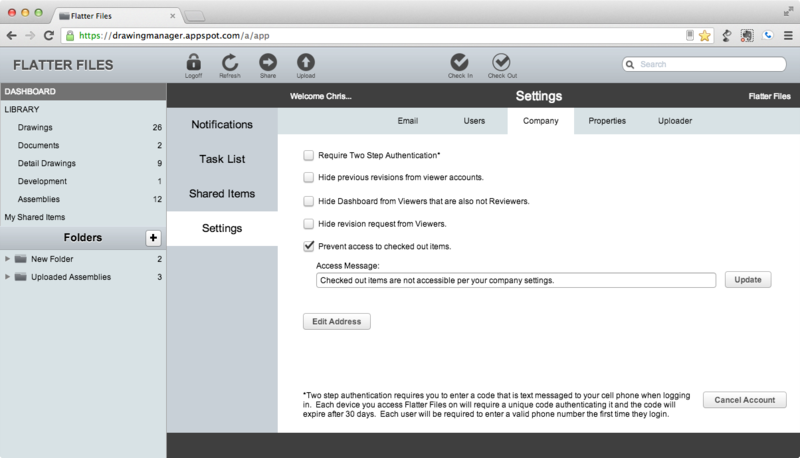 Your account can now be configured to hide checked out items from your users. Typically when a user views a checked out item the user is notified that the item is checked out and the current revision is then displayed. If you decided to hide the checked out item, the current revision is not shown and instead the user is notified that the item is checked out and not available. The option to hide checked out items can be found under company settings.